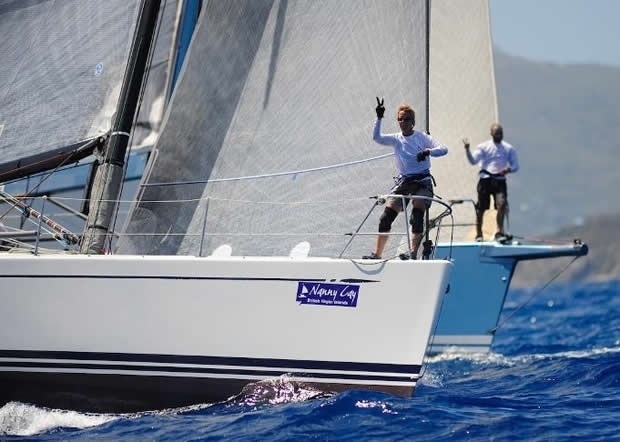 With only a few days to go to the start of the BVI Spring Regatta & Sailing Festival, the event organisers are busy preparing for a week of hot racing and legendary parties. The whole regatta starts on Monday 26 March. This year marks the 10th anniversary of the Sailing Festival and a record entry of yachts from all over the world will be taking part. Undoubtedly the fastest yacht competing will be Paradox, skippered by Frenchman, Olivier Vigoureux. The 63ft multihull is capable of ballistic speed, hitting 38 knots during this year's RORC Caribbean 600. Probably the fastest monohull will be American Bill Alcott's STP65 Equation. The Farr-designed speed machine is a past winner of the Rolex Sydney Hobart Race and Alcott has a highly accomplished team on board visiting from Miami. Bill Alcott won the first BVI Sailing Festival and he has been coming back ever since. A huge variety of yachts will be competing including the Whitbread Maxi Rothmans. Bill Erixon and his Swedish team is celebrating a world sailing tour and chose the BVI Spring Regatta for their Caribbean adventure. From Los Angeles, California, a Wild West duel is likely between two one design Farr400s. Mick Shlens' Blade should be evenly matched with Dougie Baker's Magnitude. From Trinidad, Peter Peake will be campaigning his new charge, Peake Yacht Services. The Reichel Pugh 37 is a pocket rocket and a former winner of the Cape Town to Rio Race. British entry, Diamonds are Forever skippered by Annie O'Sullivan, should prove to be one of the more colourful entries. The all-girl sailing school has a reputation for consistent form at regattas, by partying as hard as they sail on the water! The Sailing Festival kicks off the week long festivities and starts with an awe-inspiring passage races from Nanny Cay to the Bitter End Yacht Club in beautiful Virgin Gorda. The return passage race down the channel, to Nanny Cay Marina will complete the Sailing Festival, bringing the fleet back to Tortola in time to join the party for the BVI Spring Regatta. Nanny Cay Marina will already be buzzing; Wednesday and Thursday 28-29 March, Nanny Cay will play host to the GILL BVI International Match Racing Championships. Two days of exciting duels between IC24s on tight windward leeward courses. Eight international teams will battle it out in an ISAF sanctioned Grade 3 match racing event. With expert race commentary, spectators can follow the drama as it unfolds from the shore of Nanny Cay. The BVI Spring Regatta attracts the largest fleet at the event and runs from 30 March-1 April. With three days of world-class racing action and famous beach parties at Nanny Cay Marina, the regatta is not to be missed. The action off the water includes the annual bikini show on Saturday and stilt walking Moko Jumbies on Sunday night, so there's plenty to entertain racers and spectators alike. Every evening,video footage from the day's event will be broadcast in the Race Village.